Meat gets a bad rap: Eating too much is associated with increased risk of cardiovascular disease and cancer. But according to the Harvard School of Public Health, this depends largely on the types of meat you choose, and some are far healthier than others. Meat serves as a good source of protein. Just make wise choices when deciding what to put on your plate. When it comes to meat, it doesn't get much leaner than poultry -- in particular, the white meat. Chicken and turkey are both high in protein and low in fat. 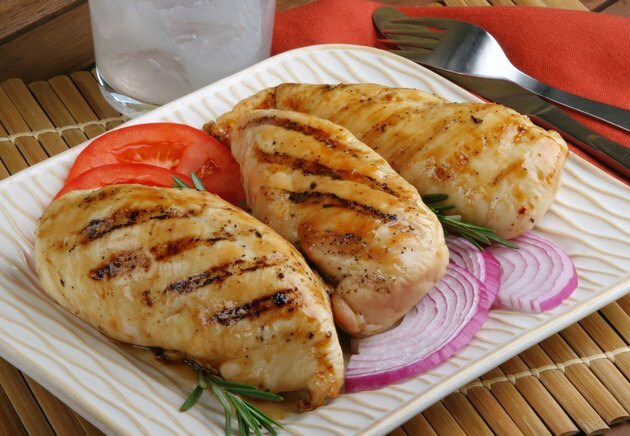 Three ounces of chicken breast has 7 grams of fat and 25 grams of protein, while the same amount of turkey breast has 6 grams of fat and 24 grams of protein. Red meats aren't completely off the menu when you're trying to eat healthier. According to the Heart Foundation, red meat is an important source of iron, which is particularly important for women. For men it provides zinc, needed for reproductive health. Select lean cuts of red meat, such as sirloin or top round, along with pork tenderloin. Fish in your diet as a protein source is a viable alternative to land animals. Low-fat, or non-oily, fish include cod, canned tuna, tilapia and snapper. These have the advantage of being good sources of protein, but also low in calories. Oily fish are higher in fat and calories, but can also be beneficial for health. The average adult should aim for two to four servings of oily fish per week, with good sources being salmon, mackerel and herring. Aside from picking lean cuts, there are several other measures you can take to ensure your meat is as good for you as possible. Trim excess fat, grill rather than fry, or roast meat on a rack to drain excess fat. As much as possible, avoid processed meats such as pastrami and poor-quality burgers and sausages with a low meat content. WeightLossResources.co.uk: How Much Oily Fish? How Many Calories Does Meat Have?